The Great Seal of the Realm or Great Seal of the United Kingdom of Great Britain and Northern Ireland (known prior to the Treaty of Union of 1707 as the Great Seal of Great Britain and the Great Seal of Ireland; and from then until the Union of 1801 as the Great Seal of the United Kingdom of Great Britain and Ireland) is a seal that is used to symbolise the Sovereign's approval of important state documents. Scotland has had her own great seal since the 14th century. The Acts of Union 1707, joining the kingdoms of Scotland and England, provide for the use of a single Great Seal for the united kingdoms. However, it also provides for the continued use of a separate Scottish seal to be used there (this seal continues to be called the "Great Seal of Scotland" though it is not technically one). The Welsh Seal was introduced in 2011. Sealing wax is melted in a metal mould or matrix and impressed into a wax figure that is attached by cord or ribbon to documents that the Monarch wishes to make official. The formal keeper of the seal is the Lord High Chancellor. Edward the Confessor sometime before A.D. 1066 started using a "Great Seal" casting in wax of his own visage to signify that a document carried the force of his will. With some exceptions, each subsequent monarch up to 1603 and the Union of the Crowns which united the crowns of Scotland and England has chosen his or her own design for the Great Seal. When opening Parliament, on 3 September 1654, the Lord Protector Oliver Cromwell was escorted by the three "Commissioners of the Great Seal of the Commonwealth of England", who were Whitelock, Lisle, and Widdrington. This Seal was inscribed with 'The Great Seal of England, 1648', displaying the map of England, Ireland, Jersey, and Guernsey on one side, with the Arms of England and Ireland. On the other side was shown the interior of the House of Commons, the Speaker in the chair, with the inscription, 'In the first year of Freedom, by God's blessing restored, 1648.' In 1655, Cromwell appointed three Commissioners of the Great Seal of Ireland, Richard Pepys, Chief Justice of the Upper Bench, Sir Gerard Lowther, Chief Justice of the Common Bench; and Miles Corbet, Chief Baron of the Exchequer. But they held the seal only until 1656, when Cromwell nominated William Steele, Chief Baron of the Court of Exchequer in England, Lord Chancellor of Ireland. In 1688, while attempting to flee to France, James II destroyed his Great Seal, apparently by throwing it into the River Thames in the hope that the machinery of government would cease to function. 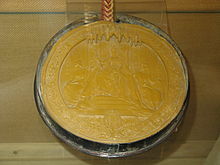 James's successors, William III and Mary II, used the same seal matrix in their new Great Seal. This may have been a deliberate choice, in order to imply the continuity of government. A new obverse was created, but the reverse was crudely adapted by inserting a female figure beside the male figure. When Mary died, the obverse returned to the design used by James II, while the female figure was deleted from the reverse. Thus, William III used a seal that was identical to James II's, except for changes to the lettering and coat of arms. Edward VIII, who abdicated in order to marry Wallis Simpson only a few months after succeeding to the throne, never selected a design for his own seal and continued to use that of his predecessor, George V. The longer-lived British monarchs have had several Great Seals during their reigns. Only one matrix of the Great Seal exists at a time, and since the wax used for the Great Seal has a high melting point, the silver plates that cast the Seal eventually wear out. Queen Victoria had to select four different Great Seal designs during the sixty-three years of her reign. The current seal matrix was authorised by the Privy Council in July 2001. It was designed by James Butler and replaced that of 1953, designed by Gilbert Ledward. The obverse shows a middle-aged Elizabeth II enthroned and robed, holding in her right hand a sceptre and in her left the orb. The circumscription ELIZABETH . II . D . G . BRITT . REGNORVMQVE . SVORVM . CETER . REGINA . CONSORTIONIS . POPVLORVM . PRINCEPS . F . D . is the abbreviated Latin form of the royal title. On the reverse are the full royal arms, including crest, mantling and supporters. This is the first time that the royal arms have provided the main design for one side of the British Great Seal. The reverse of the 1953 version depicted the Queen on horseback, dressed in uniform and riding sidesaddle, as she used to attend the annual Trooping the Colour ceremony for many years until the late 1980s. The seal's diameter is 6 inches (150 mm) and the combined weight of both sides of the seal matrix exceeds 275 troy ounces (302 oz; 8,600 g). The Great Seal is attached to the official documents of state that require the authorisation of the monarch to implement the advice of the Government. Under today's usage of the Great Seal, seals of dark green wax are affixed to letters patent elevating individuals to the peerage, blue seals authorise actions relating to the Royal family, and scarlet seals appoint bishops and implement various other affairs of state. In some cases the seal is replaced by a wafer version, a smaller representation of the obverse of the Great Seal embossed on coloured paper attached to the document being sealed. This simpler version is used for royal proclamations, letters-patent granting the royal assent, writs of summons to Parliament and for licences for the election of bishops and commissions of the peace. It formerly constituted treason to forge the Great Seal. The Great Seal of the Realm is in the custody of and administered by the Lord Keeper of the Great Seal. This office has been held jointly with that of Lord Chancellor since 1761. The current Lord Chancellor is David Gauke. The Constitutional Reform Act 2005 reiterates that the Lord Chancellor continues to be the custodian of the Great Seal. The Clerk of the Crown in Chancery, who is also Permanent Secretary of the Ministry of Justice, heads Her Majesty's Crown Office, and is responsible for the affixing of the Great Seal. He is assisted by the Deputy Clerk of the Crown. Day-to-day custody is entrusted to the Clerk of the Chamber, and subordinate staff include a Sealer, and two Scribes to Her Majesty's Crown Office. 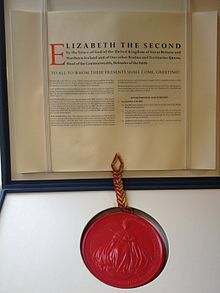 “ 2 - (1) A warrant under Her Majesty’s Royal Sign Manual, countersigned by the Lord Chancellor, or by one of Her Majesty’s Principal Secretaries of State, or by the Lord High Treasurer, or two of the Commissioners of Her Majesty’s Treasury, shall be a necessary and sufficient authority for passing any instrument under the Great Seal of the United Kingdom, according to the tenor of such warrant; Provided that any instrument which may now be passed under the Great Seal by the fiat or under the authority or directions of the Lord Chancellor or otherwise without passing through any other office may continue to be passed as heretofore. (2) The Lord Chancellor may from time to time make, and when made revoke and vary, regulations respecting the passing of instruments under the Great Seal of the United Kingdom, and respecting the warrants for that purpose, and the preparation of such instruments and warrants, and every such warrant shall be prepared by the Clerk of the Crown in Chancery. (3) No person shall make or prepare any warrant for passing any instrument under the Great Seal of the United Kingdom, or procure any instrument to be passed under that Seal otherwise than in manner provided by this Act or the Crown Office Act 1877; and any person who acts in contravention of this section shall be guilty of a misdemeanour. The Great Seal for each successive monarch is inscribed with the monarch's names and titles on both sides of the seal. Some of those used in the past are shown below. Where the inscriptions on both sides of the seal are identical, only one is given. Where they are the same except for the use of abbreviations, the one with the fuller forms is given. Where they are different, they are shown separated by a slash. Seal of Edward, Sovereign of the English. William, by the grace of God, King of the English. Henry, by the grace of God, King of the English / Henry, by the grace of God, Duke of the Normans. Stephen, by the grace of God, King of the English. Henry, by the grace of God, King of the English / Henry, by the grace of God, Duke of the Normans and of the Aquitanians and Count of the Angevins. Richard, by the grace of God, King of the English / Richard, by the grace of God, Duke of the Normans and of the Aquitanians and Count of the Angevins. John, by the grace of God, King of England and Lord of Ireland / John, Duke of Normandy and of Aquitaine, Count of Anjou. Henry, by the grace of God, King of England, Lord of Ireland, Duke of Aquitaine. Edward, by the grace of God, King of England, Lord of Ireland, Duke of Aquitaine. Edward, by the grace of God, King of England, Lord of Ireland and of Aquitaine. Richard, by the grace of God, King of France and England and Lord of Ireland. Henry, by the grace of God, King of France and England and Lord of Ireland. Henry, by the grace of God, King of France and England and Lord of Ireland / Henry, by the grace of God, King of England and France and Lord of Ireland. Henry, by the grace of God, of the French and of England, King. Edward, by the grace of God, King of England and France and Lord of Ireland. Richard, by the grace of God, King of England and France and Lord of Ireland. Henry, by the grace of God, King of England and France and Lord of Ireland. Henry the Eighth, by the grace of God, of England and France and Ireland King, Defender of the Faith, and on Earth, of the English and Irish Church, Supreme Head. ... of Edward the Sixth, by the grace of God of England, France / and of Ireland King, Defender of the Faith, and on Earth, of the English and Irish Church, Supreme Head. Mary, by the grace of God, of England, France and Ireland, Queen, first of that name, Defender of the Faith. Elizabeth, by the grace of God, of England, France and Ireland, Queen, Defender of the Faith. James, by the grace of God, of England, Scotland, France and Ireland, King, Defender of the Faith. Charles, by the grace of God, of England, Scotland, France and Ireland, King, Defender of the Faith. Oliver, by the grace of God, of the Commonwealth of England, Scotland, and Ireland, etc., Protector. Richard, by the grace of God, of the Commonwealth of England, Scotland, and Ireland, etc., Protector. Charles II, by the grace of God, of Great Britain, France and Ireland, King, Defender of the Faith. James the Second, by the grace of God, of Great Britain, France and Ireland, King, Defender of the Faith. William III and Mary II, by the grace of God, of England, France and Ireland, King and Queen, Defenders of the Faith / Golden apples grow in flowering rosebushes : The security of Britain restored. William III, by the grace of God, of Great Britain, France and Ireland, King, Defender of the Faith. Anne, by the grace of God, of Great Britain, France and Ireland, Queen, Defender of the Faith. Anne, by the grace of God, of Great Britain, France and Ireland, Queen, Defender of the Faith / Britain in the sixth year of the reign of Queen Anne. George, by the grace of God, of Great Britain, France and Ireland, King, Defender of the Faith / Of Brunswick and Lüneburg, Duke, of the Holy Roman Empire, Arch-treasurer and Prince-Elector. George II, by the grace of God, of Great Britain, France and Ireland, King, Defender of the Faith / Of Brunswick and Lüneburg, Duke, of the Holy Roman Empire, Arch-treasurer and Prince-Elector. George III, by the grace of God, of Great Britain, France, and Ireland, King, Defender of the Faith. Great Seal of the Realm of Queen Victoria attached to the charter incorporating the Dean and Chapter of the Cathedral of Saint Alban, 1900. George the Third, by the grace of God, King of the Britains, Defender of the Faith. George the Fourth, by the grace of God, King of the Britains, Defender of the Faith. William the Fourth, by the grace of God, King of the Britains, Defender of the Faith. Victoria, by the grace of God, Queen of the Britains, Defender of the Faith. Edward VII, by the grace of God, of the Britains and of the lands across the sea which are in the British Dominion, King, Defender of the Faith, Emperor of India. George the Fifth, by the Grace of God, of Great Britain, Ireland, and the Lands across the sea which are in the British Dominion, King, Defender of the Faith, Emperor of India. George the Sixth, by the Grace of God, of Great Britain, Ireland, and the Lands across the sea which are in the British Dominion, King, Defender of the Faith, Emperor of India. ^ James Roderick O'Flanagan, The lives of the Lord Chancellors and Keepers of the Great Seal of Ireland, from the earliest times to the reign of Queen Victoria, (1870), Chapter XXV. Custody Of The Great Seal During The Commonwealth. ^ Jenkinson, Hilary (1943). "What happened to the Great Seal of James II?". Antiquaries Journal. 23: 1–13. doi:10.1017/s0003581500042189. ^ Davies, Caroline (16 February 2001). "New seal of approval for Queen". The Daily Telegraph. Retrieved 25 October 2013. ^ "Great Seal of the Realm". The Royal Household. 2009. Retrieved 25 October 2013. ^ In full: Elizabeth Secunda Dei Gratia Britanniarum Regnorumque Suorum Ceterorum Regina Consortionis Populorum Princeps Fidei Defensor. This is the official Latin form of the royal title: Elizabeth II by the Grace of God of the United Kingdom of Great Britain and Northern Ireland and of Her other Realms and Territories Queen, Head of the Commonwealth, Defender of the Faith. ^ "The University's Original Charter". University of Toronto. Retrieved 25 October 2013. Bedos-Rezak, Brigitte (1986). "The king enthroned, a new theme in Anglo-Saxon royal iconography: the seal of Edward the Confessor and its political implications". In Rosenthal, J.T. (ed.). Kings and Kingship. Binghamton, NY: State University of New York: Center for Medieval and Early Renaissance Studies. pp. 53–88. Harvey, P.D.A. ; McGuinness, Andrew (1996). A Guide to British Medieval Seals. London: British Library and Public Record Office. pp. 27–34. ISBN 0-7123-0410-X. Jenkinson, Hilary (1936). "The Great Seal of England: deputed or departmental seals". Archaeologia. 85: 293–340. doi:10.1017/s026134090001523x. Jenkinson, Hilary (1936). "The Great Seal of England: some notes and suggestions". Antiquaries Journal. 16: 8–28. doi:10.1017/s0003581500011355. Jenkinson, Hilary (1938). "A new seal of Henry V". Antiquaries Journal. 18: 382–90. doi:10.1017/s0003581500015547. Jenkinson, Hilary (1953). "The Great Seal of England". Journal of the Royal Society of Arts. 101: 550–63. Maxwell Lyte, Sir Henry C. (1926). Historical Notes on the Use of the Great Seal of England. London: HMSO. Perceval, R. W. (1948). "The Great Seal". Parliamentary Affairs. 1 (4): 40–46. Wyon, Alfred Benjamin; Wyon, Allan (1887). The Great Seals of England: from the earliest period to the present time. London: E. Stock. Wikisource has the text of the 1905 New International Encyclopedia article Great Seal. This page was last edited on 24 March 2019, at 10:38 (UTC).